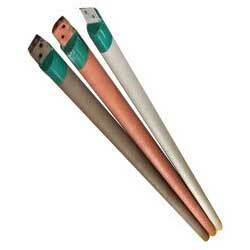 Are you looking for the best Alloyed Coated Earthing Electrode Suppliers in India? If yes, then S-TECH ENGINEERS marks an end to your search. The company has specialized in the manufacturing and supplying of top quality Coated Earthing Electrode and Non-Coated Earthing Electrode across India. These electrodes are manufactured using advanced Special Purpose Machine technology. The Coated Earthing Electrode is used in petrochemical industry, nuclear facilities, telecom sector, automation industry, power industry, military & defense installations, etc. The Coated Earthing Electrode is acclaimed amidst the clients for its efficient performance, high electrical conductivity and superb mechanical strength. Further, this electrode has uniform coating and mat finishing. We can provide customization on manufacturing of our Electrodes, both Coated and Non-Coated, to meet the specific requirements of our clients.